Today is Labor Day in my country... YAY... so I am chilling with Second Life... hahaha ( some will says I do not have a life). Anyway it doesn't matter what others are saying as long you can see yourself clear enough.. So...to continue my stories, I came back and homeless, and were in sandbox for few days... anyway, I have no friend to talk too in SL too, and no place to go too...You now might ask why I am still in SL or I am having a weird life too in SL. I am not sure how you all get friends in SL, but it is kinda hard for me, and for all my friends, they are either creator, or blogger, and so.. shut up.. i am busy :p.
And to cut the stories short, I decided to go back to my old sim, and lucky for me, Ayako has a parcel to rent out to me, and Yay Yay Yay, I am no longer homeless. 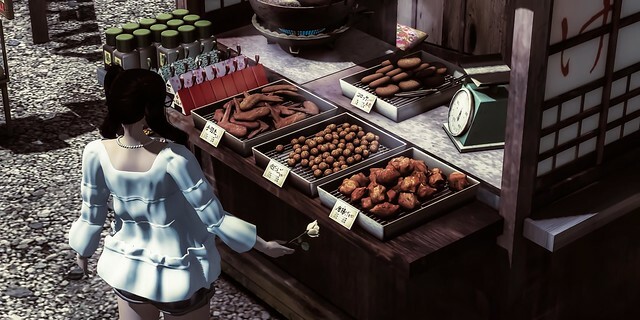 And so, my quest began, I am searching for a perfect home, so i browse everywhere, and found one, and it is not yet for sale...sssszzzsshhsshss.... gotta wait till 12 noon today.... and I am grumpy, so I went to the creator sim and found food and they look delicious... jajajjaaja..